Complimentary access to over 10 VIP lounges in the Middle East and the Levant. Get free membership and various discounts on shipping with MyUS when buying across thousands of U.S. online stores. Up to 15% discount on your next car rental when you book with Avis. Purchases are protected in case of thefts and accidental damages. Up to 30% discount on booking the travels with Clear Trip. Top of the line offers at 9 shopping villages in Europe such as VIP invitations, discounts on shopping packages and chauffeur drives, and access to VIP lounges. Download “MasterCard For You” and “MasterCard Buy 1 Get 1” Applications on your smartphone to learn more. 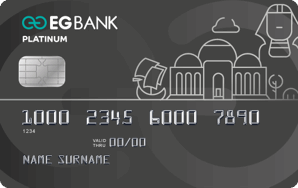 Now you can benefit from the different instalment programs offered by EGBANK. Enjoy EGBANK’s discounts at a large number of selected shops. Earn points with every purchase you do using your card and redeem them as cash back on your card account.